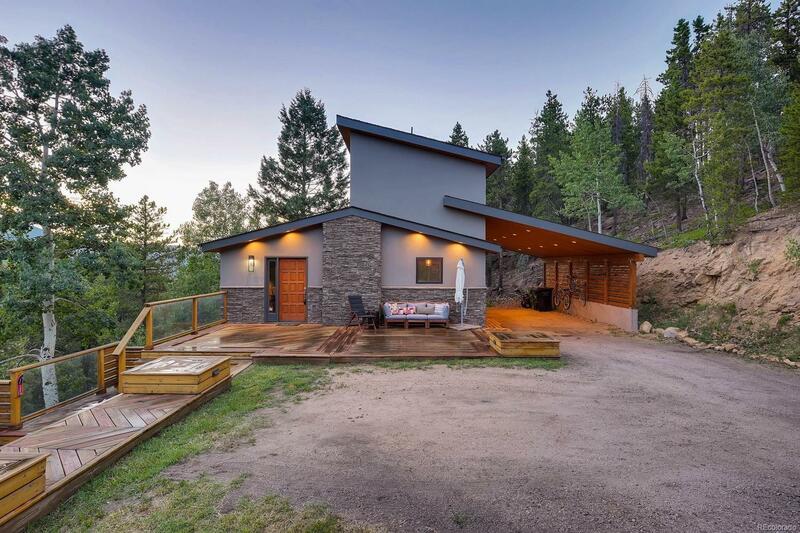 This striking, modern home is nestled amongst breathtaking mountain views. Stacked stone and stucco with cedar accents create a beautifully balanced exterior. Cascading decks with built-in seating are ideal for appreciating the outdoors and lead down to your level yard space, opportunistic for entertaining. The interior is perfection with wood floors, vaulted ceilings, and luxurious fixtures and accents. Your open kitchen features subway tile backsplash, sleek black cabinetry, and stainless steel appliances. Large windows are throughout bringing the staggering views indoors. The newly updated wood burning fireplace in the living room is a beautiful feature in addition to the wood stove in the basement family room. Immersed in nature and surrounded by several creeks and mountain trails, adventure is at your fingertips. Enjoy one night of the Colorado sunset against the mountain backdrop, and youâll never want to leave home.